WOW! It's a busy day around here! As it turns out, I happen to have a few tutorials floating around today! LOL! So, here's the deal. I'm going to give you a peek at each project and then tell you to get your little blog reading selves on over to the blogs so you can check out the full tutorials!!! YAY for fun stuff and sharing ideas!!! Okay, so here's the first one. This one is over on the Amazing Mold Putty blog. 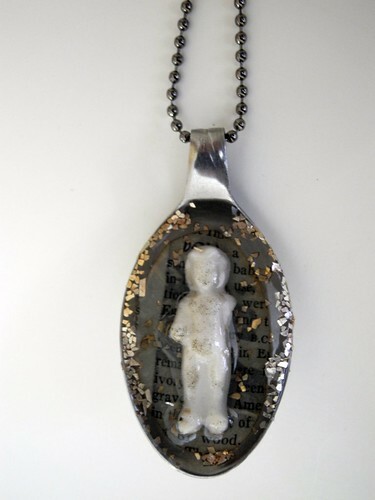 I created this spoon pendant by molding a genuine frozen charlotte doll and then making a cast version. I then placed it in the spoon and filled the spoon with clear cast resin. You are totally going to want to see this tutorial! It's so fun! And really easy, too! This project took very little work time! K....so, the next one is a fun stamping technique that I'm showing off over at Skipping Stones Design. 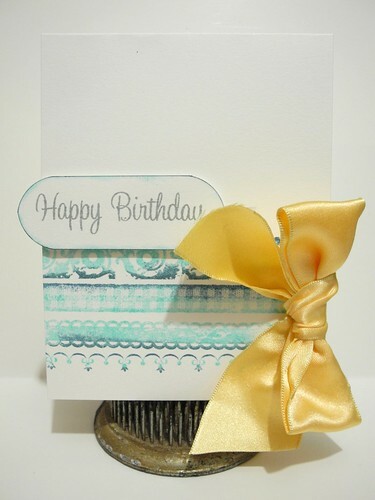 I created this cute card and I'm showing you how to get that fabulous rolled color look with your stamps! It's an oldie, but a goodie! HA! I totally just said that! What am I 80? LOL! Anyway, you can find that tutorial over on the Skipping Stones Blog where you can also find the Sketch #99 Challenge where you can create a card for a chance to win free stamps! No SSD stamps required! Just follow the sketch and link up! ....*let's out breath that she had been holding since the wait for it gig.....*I sorta made this super cute Tiny Butterfly Topiary and I sorta wrote a tutorial so you can make your very OWN adorableness!!!! You know you want to. So...this one will be going up later today, so be sure not to miss it! ETA: Here is the direct link to the Tiny Topiary Tutorial on the May Arts blog. Have fun! Whew! K. I'm tired now. That's a lot of tutelage going on up there. Just say'n. Loving those tutorials today - Will have to look at them fully when I am at home later on. Thanks alot Honey for them! Loving everything as usual! That butterfly tree is awesome! Beautiful!! I can't wait to give this a try!! I hope you have a super day!!! You are a busy lady!! Great projects! Got the tutorials bookmarked for leisurely reading on Saturday morning! THANK YOU! And your butterfly topiary is awesome! Kinda like YOU! what fun projects! love the idea of using spoons for jewelry! Wow, I'm exhausted! :) Awesome projects! I think I love the topiary...so, so cool! I am totally swooning over the necklace! You've been busy! Everything looks great - I really like the butterflies. 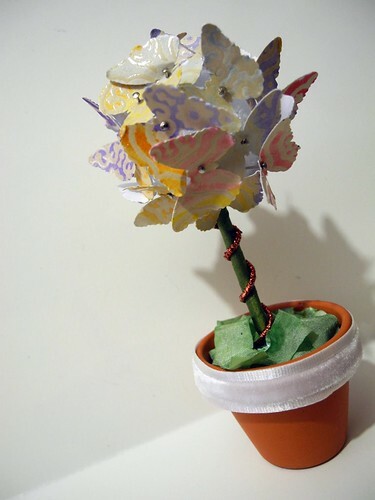 I'm soooo gonna make the butterfly topiary. So stinkin cute, Jingle. Awesome pendant! I've been plqaying with molds myself lately. I'll show on my blog soon. There really is no limit to your creativity. That butterfly tree is amazing. Wow you've been busy! Great ideas, thanks for sharing! No wonder you're tired! Thanks for all this tutorial wonderfulness! And the blog week is great, I've been following along. Lots of inspiration there! wow, you really have been busy, all gorgeous but my fave is the butterfly topiary! You really do wonders with may arts ribbon, fantastic projects! Wow! You have been busy!! Very nice work! The spoon is my favorite! Incredible!